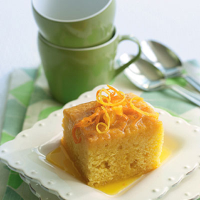 Serve this buttery, citrus-rich cake with a dollop of crème fraîche or Greek-style yogurt. Preheat the oven to 170°C/gas 3. Beat the butter and sugar until creamy and almost white. Beat in the lemon zest, then the eggs, one by one, and the lemon juice. Sift in the flour, and mix well. Pour the batter into a greased 20cm-square cake tin lined with non-stick baking parchment. Bake for 50 minutes or until an inserted skewer comes out clean. To make the syrup, put the sugar, lemon juice, orange juice, orange slices and zest in a pan, and simmer, stirring, for 3 minutes to make the oranges break down a little. Turn out the cake and cut it into 9 generous squares. Pierce the top of each square with a skewer, and spoon the hot syrup, chopped orange and zest over the top. Dark Italian coffee works well with the syrupy citrus notes of this cake.